Why does the Mercedes V Class stand out from the crowd? In years gone by people carriers were not very refined vehicles to travel, they could be quite cramped inside with limited boot space…. However with the new Mercedes V Class People Carrier things have changed. 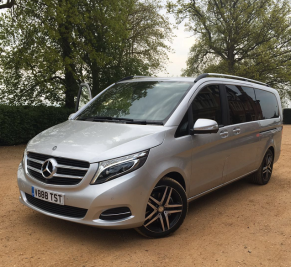 Mercedes have produced an executive vehicle very popular with chauffeur companies because of its versatility to suit lots of different travel requirements. The new shaped V Class is no ordinary people carrier since Mercedes has given them some of the creature comforts that you would normally find in their more executive saloon cars like the Mercedes E & S Class Ranges. With good quality suspension, ample head and leg room they are a joy to be driven around in by your chauffeur for short or long distance journeys. Here at TST Cars we have a two different types of Mercedes V Classes People Carriers, giving us greater service flexibility. One is able to accommodate up to 6 passengers and the other up to 8 passengers and their luggage. So whether the V Class is being used for Airport Transfers because of their generously sized boot space or you have a Corporate, Sporting Event to attend where there is a need for larger groups of passengers to travel in comfort and safety they are a joy to be driven around in. So if you have the need to be moved around in style do not hesitate to get in touch with us today and discuss your next journey requirements.